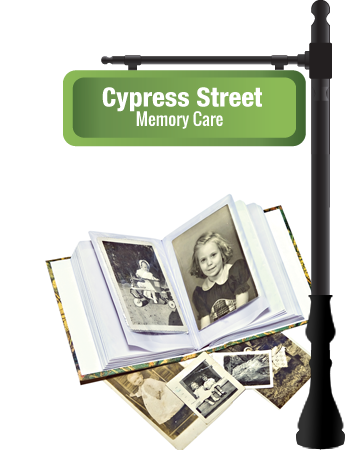 Cypress Street, our memory care neighborhood under the medical and psychiatric direction of Dr. Sumer Verma, offers a secure and nurturing setting for individuals in various stages of dementia and Alzheimer’s disease. Our care partners in this secured neighborhood are well trained in the most recent advances in Alzheimer’s and dementia treatment. In addition, every one of our employees undergoes intensive training developed by the Alzheimer’s Association to ensure they are uniquely attuned and sensitive to our residents’ singular needs. We believe that every behavior represents an unmet need and never turn to medication as an easy solution. Under our care, medication levels are brought down 90%! Designed to fill every moment of each day with life-enhancing experiences, our specialized Alzheimer’s & Dementia Recreation Program focuses on eliciting and sustaining positive emotions, maintaining dignity, and creating moments of success. The program is directed daily by a full-time Certified Memory Care Activity Director who is a Certified Eden Educator and credentialed as a Certified Dementia Practitioner. Please fill out the form below to receive a copy of our Memory Care brochure.